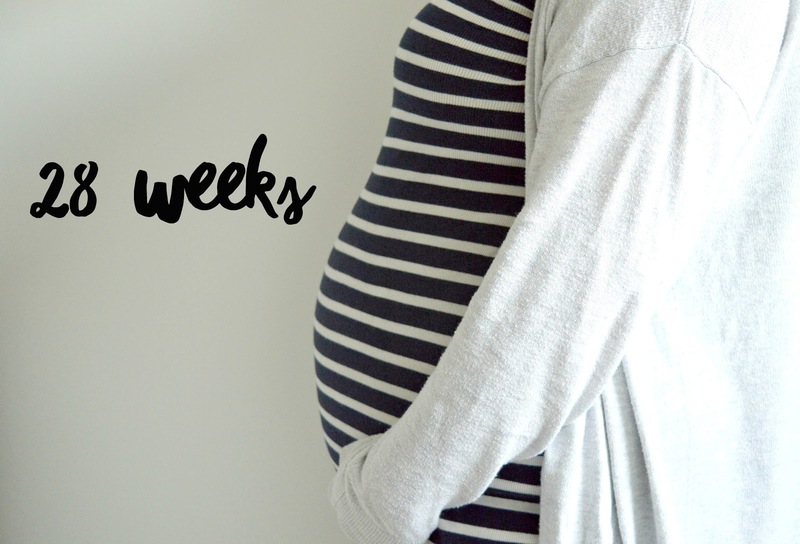 This is my 28 week pregnancy update with baby number two. This week marks the start of the third (and final) trimester! It's been very busy with a hospital appointment, a midwife visit and much more! Baby's eyes are now partially open and her tiny eyelids are able to blink. Baby girl is also able to recognise different levels of light, inside inside my womb. Even though baby still has to grow a lot, her little body is getting chubbier as fat is depositing under her wrinkled skin. Baby has a 95 percent chance of survival if born at the end of this week and the lungs are better prepared to breathe, but would still need medical assistance. I've been feeling quite tired this week and very pregnant. Which is know is pretty obvious, but I'm really starting to feel it now. My bump is a lot bigger, so I struggle to pick things up and put my socks on every morning! The heartburn has been more frequent this week, so I've made sure to keep Gaviscon close by! I've found my lower back has been really achey and quite painful at times, just from doing housework etc. I'm trying to take it easy but I may have to hire a TENS machine soon which will hopefully help. I had a hospital appointment this week for my anti-d vaccination (as I'm rhesus negative). They also routinely took blood to check my iron levels, which they usually do at your 28 week midwife appointment. The day after, I saw my midwife, who was super lovely and we both recognised each other from my previous pregnancy with Sophie (which was over four years ago!). She checked my blood pressure and urine which were both fine and we listened to baby's heartbeat, which was so nice to hear. The bump was measuring at 27.5 weeks which is pretty much right on track. I see her again at 34 weeks, so I'm sure we will discuss birth options etc. again then. I'm still sleeping really well using my pregnancy pillow. I have been feeling lots of regular movement from baby girl, although she still isn't in a pattern yet where I feel her at the same time every day. Same as last week - nothing! This week we (as in Toby) put the shelves up in the nursery! They're even better than I expected them to be and I think it's lovely that he made them from scratch. I also ordered baby's new cotbed, which I can't wait to arrive and put up. It will actually look like a nursery then! The nursery is finally coming together and I'm looking forward to getting it finished soon.